Your first visit is one hour (60 minutes). After a short new patient intake form, Dr. Berenstein will review your health complaint(s) and health history with you, conduct a physical examination, share his findings with you, and begin your treatment. During your first visit with me, I will attempt to identify the root of your problem. Reviewing your health history and performing a physical examination will help me identify how to begin your care to provide you with the most efficient and effective treatment options. After reviewing your diagnosis, we will talk about your options for care and answer any questions you may have. If you agree that my chiropractic and rehabilitation treatment plan is right for you, I will ask you to fill out a consent form and then we can begin care. Different injuries and health complaints often require more than just the first visit. 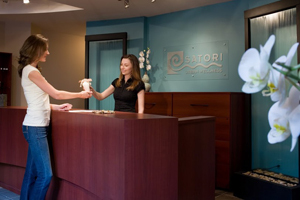 At your first visit, we will talk about your treatment plan and expectation for future visits. Future treatment visits will be recommended to maximize your recovery and prevent relapses. Treatment visits are either 25, 40, 55 minutes, depending on how much time I need to provide the best quality care for your complaint(s). To keep you updated with all the latest news and advancements in chiropractic care, our website offers blog posts regularly on topics that matter to you! And, we’ll continuously monitor your progress to make sure we’re achieving your goals. Sound good? Contact our Toronto chiropractic office so we can get started soon.